Son and father Kenneth M. and Isaac A. 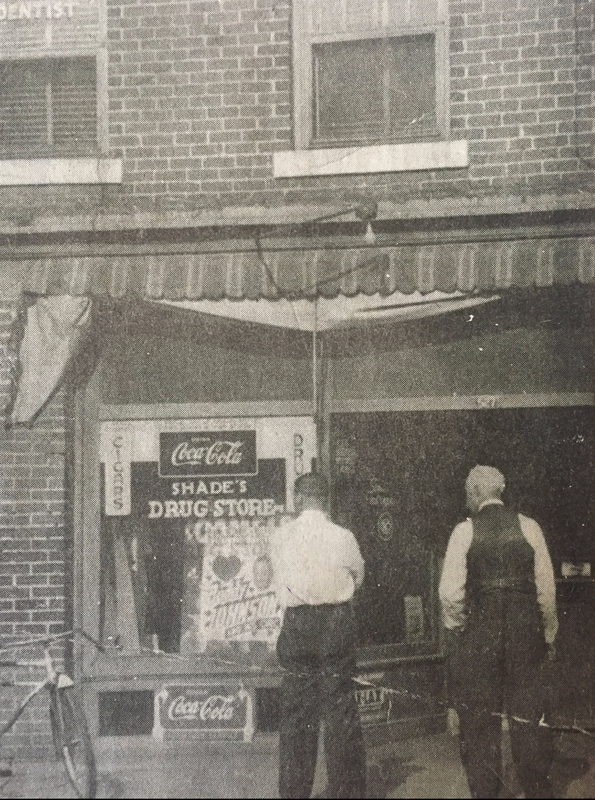 Shade, pharmacists, in front of Shade’s Pharmacy, 527 East Nash Street, 1949. Photograph courtesy of Kenneth M. Shade, Jr. Clerk comes to the city. New York Age, 13 September 1917. In the 1900 census of Asheville, Buncombe County: at 174 Haywood Street, Isacc Shade, 24, laborer; wife Emma, 29; and children John, 7 months; and mother Alice Shade, 40. In the 1910 census of Asheville, Buncombe County: on Jordan Street, Isacc Shade, 34, physician at drugstore; wife Emma, 22; son John, 10, Alice, 8, and Kenneth, 3; and widowed roomer Ollie Burgin, 41. 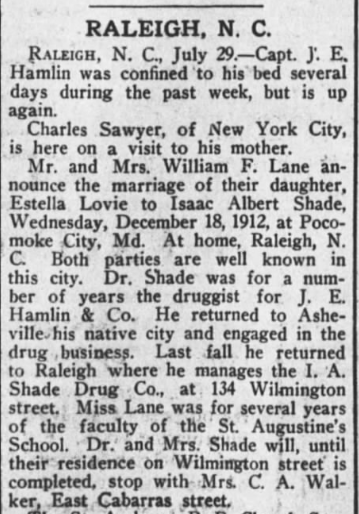 Isaac Shade moved his family to Wilson shortly before World War I, and he opened a pharmacy on Nash Street. John Albert Shade registered for the World War I draft in Wilson in 1918. Per his registration card, he was born 10 August 1900; resided at 530 East Nash Street, Wilson; worked as a clerk at Shade’s Pharmacy, 530 East Nash; and had blue eyes and black hair and no apparent disqualifications. On 27 September 1922, John A. Shade, 22, and Ruby Percell, 20, both of Wilson County, were married by Presbyterian minister A.H. George in the presence of W.H. Phillips, Henry N. Cherry and Will Farmer. In the 1925 New York State census, in Brooklyn: at 718 Cleveland, John Shade, 24; wife Ruby, 21; and daughter Emma, 1. John worked as an attendant at Grand Central Station. In the 1940 census of Bronx County, New York: North Carolina-born hotel elevator operator John Shade, 40; South Carolina-born wife Rubie, 35, bedding operator; and daughters Emma, 16, and Grace, 13. John A. Shade died 8 October 1969 and is buried in Rest Haven cemetery, Wilson. Per Social Security records available at Ancestry.com, Emma Evangeline Shade was born in New York on 4 February 1924 to John A. Shade and Ruby I. Purcell. Emma S. Galiber died 19 June 1995. The twentieth in a series of posts highlighting buildings in East Wilson Historic District, a national historic district located in Wilson, North Carolina. 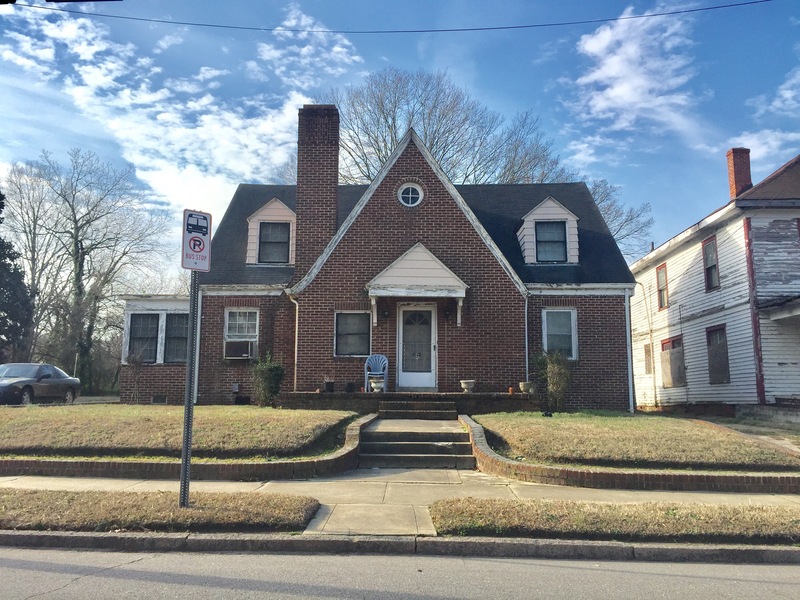 As originally approved, the district encompasses 858 contributing buildings and two contributing structures in a historically African-American section of Wilson. (A significant number have since been lost.) The district was developed between about 1890 to 1940 and includes notable examples of Queen Anne, Bungalow/American Craftsman, and Shotgun-style architecture. It was listed on the National Register of Historic Places in 1988. On 29 November 1898, Isaac A. Shade, 23, of Buncombe County married Emma Green, 21, of Buncombe County in Buncombe County. New York Age, 31 July 1913. Isaac Albert Shade registered for the World War I draft in Wilson on 12 September 1918. Per his draft card, he lived at 110 Pender Street, Wilson; was born 17 May 1876; was a self-employed druggist at 530 East Nash Street, Wilson; and wife Estella Shade was his nearest relative. In the 1920 census of Wilson, Wilson County: at 535 Nash Street, Turner Stokes, 50, carpenter; wife Morah, 39; mother-in-law Martha Pitt, 83; and boarders Isac Shade, 44, drugstore manager; wife Estella, 38; and children Kenneth, 13, and Sarah, 9. In the 1940 census of Wilson, Wilson County: at 602 Green Street, drugstore owner Dr. I.A. Shade, 63; wife Estelle, 54, city school teacher; niece Myrtle Lane, 23, county school teacher, and nephew George Lane, 21, drugstore clerk; and roomers Louisa [illegible], county school teacher, Vera Green, 18, housekeeper, and Catherine Ward, 20, county school teacher. Isaac Albert Shade died 24 April 1953 at his home at 602 East Green. Per his death certificate, he was born 17 May 1875 in Morington [Morganton], North Carolina, to London Shade and Alice (last name unknown); was married; and was a pharmacist at a drugstore. Sarah Shade was informant. 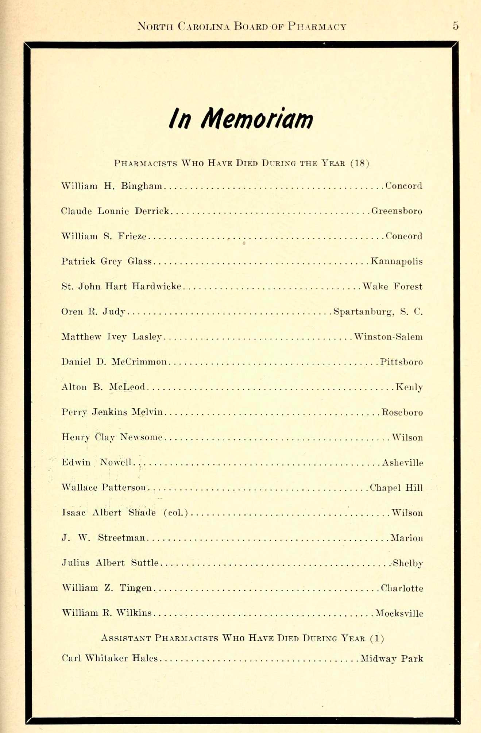 Seventy-Second Annual Report of the North Carolina Board of Pharmacy (1953). Photo of house by Lisa Y. Henderson, February 2017; undated photo of Shade’s Drug Store, 527 East Nash Street, courtesy of Delores Thomas, reprinted from Wilson Daily Times, 22 February 2008.